First, I want to wish a Happy Father's Day to all fathers, grandfathers, soon-to-be-fathers and want-to-be-fathers. No matter what your status in life is, there is so much you can do to help all those children around you who need love, support and a fatherly hand in their lives... I hope, you all had an amazing day!! Congrats!!! That's so exciting! Very happy for you all!! Or a couple of them :) Thank you, Lynn! Congratulations! That's a pretty good excuse for not blogging--much better than mine. I'm so excited for you Lena and family!!!! Yep, there are two buns baking in there :) Judy, is that you?? No, it isn't Judy. It's D, an anonymous commenter who is very excited for you! Congrats again! That is such fantastic news. Congratulations to you all. Now the spare room has alternative purpose. Yay! Congratulations Lena! I'm so pleased for you all! This is the best news!! I cant even express how happy I am for you guys!!! Congratulations to you all!!! Did you tell the boys yet? Yes, we did :) We even had a discussion on how babies are born with my oldest (to which he told me that he will never get married...), and my younger one said that I went to the doctor, the doctor gave me a shot, and now I have babies in my tummy :) I can live with this explanation for a few more years :) But they are really excited!! WOOHOOO!! It is a very special Fathers day at your house!!! I suspected that was what was going on. I'm glad that I was right. Congratulations. oh Congratulations!! So exciting!! 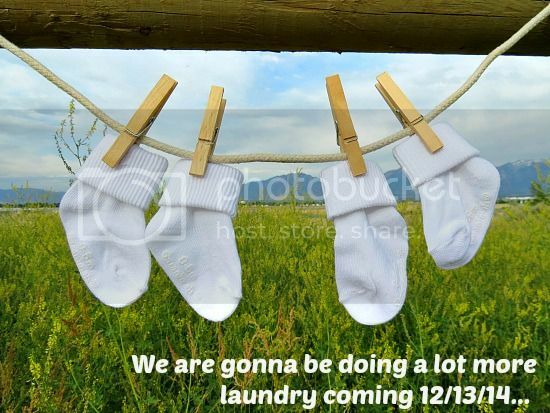 hmmm the picture shows 2 pair of socks??? Twins??? How exciting for all of you! Ooh, that's so fantastic! Woo hoo! Many congrats! I'm so happy for you guys. You may be due a bit earlier than my sister! Love the due date too. That's a mighty good reason for going MIA. Hope you're feeling well and not under morning sickness. I've heard that stuff is not fun (though it is worth it). Well, I had better days, that's for sure :) This thing is being dragging along a bit longer than it did with my other kids but I'm hoping I will feel the bliss of the second trimester very soon. I didn't know your sister was pregnant?? That's exciting! I hope, she's doing well! Congratulations!! How exciting for you and your family. Yeah! Congratulations to your family! Congratulations and I hope things go well for you! Yay!! I am so excited and happy for you!!!!! Whoa, twins? I didn't even catch on to that when I saw it on FB. You poor dear! Super exciting but a rough pregnancy ahead! Congrats. Yay yay yay! I'm so happy for you! Twins!! Woohoo! And I totally understand about posts being "bland" without sharing the news... That was why I didn't blog for three months. I couldn't bring myself to share the news, but I couldn't be totally transparent either. Anyway. Yay for the news being out now! Hoorray!!!!! Yay! I am so excited for you and your family! We just found out Friday that my 3 year old daughter will be getting a baby sister in October. Congrats and I hope you don't have bad morning sickness! CONGRATULATIONS!!!!!! I'm so so happy for you!!!! I haven't been reading blogs much for a few weeks and what happens... AHHHHHH, Congratulations!!! How awesome! Yay!